Let me tell you about this thing called OXHEART. There is a thing we are all searching for in New York, and that thing is community. A group of people like us who just ‘get it.’ Our crew, our group of lovers who blend perfectly with our selves and finish the sentences we’ve only just begun. I had it in college, and truly believed that eventually it would pop up here in New York. I’m proud to say, finally, it has. OXHEART started with Bryn Larson, in a bar on the Lower East Side, the same night I heard Iced Ink for the first time. 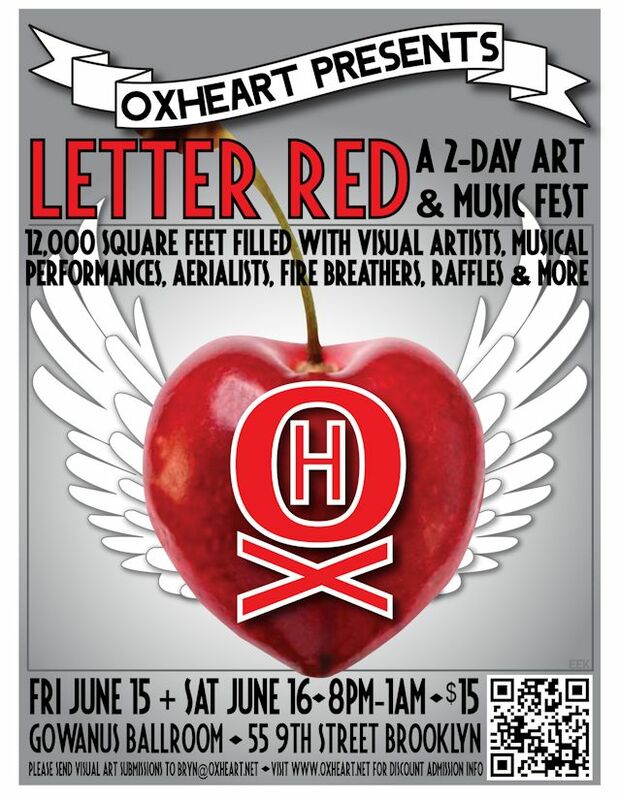 OXHEART was to be a new arts and music collective, a party, an event, a happening, a place where people could meet and share what they create, be it music or art. I didn’t know who this very happy tall, blonde woman was, but she was instantly welcoming. As if to say okay, I like you, we’re friends now. Done. Two weeks later, we gathered for our first OXHEART meeting. I was brought in to do any and all things words or media. Ideas flowed, decisions were made, meeting times were chosen, roles were discussed. Though the lineup of OXHEARTers later changed, four original members remained and, frankly, we’re all the better for it. In just three months, we had it all—a venue, artists, musicians, and it all was coming together. The Gowanus Ballroom was by day Serett Metalworks, a sculpture and metalworking space right next to the Gowanus River in Brooklyn. Gorgeously high lofted ceilings were swept through with beams, brick walls painted white, a sheen of beautiful dirt and use running across the floors. It was a venue that held many art shows, and they knew how to hold ours as well. Artists rolled in courtesy of friends, connections, and reaching out to various schools and even strangers. It is mindnumbing to think so many people have the opportunity to call themselves ‘artist’ and have it truly mean something. But I think Bryn always knew that. A lady who appreciates people who do what they love, she wanted a way for them to get exposure, to have the beauty of their work seen by others. I believed in her vision and happily worked, as we all did, without pay. The lady worked tirelessly, as did Tech/Design Hombre Mike Krenner, myself, and Photographer Carlos Henriquez, within our own OXHEART roles. The motivation came from the spirit of doing something bigger. It wasn’t about the money now. It was about showing something beautiful and creating a community of people who all thought in the same ways. 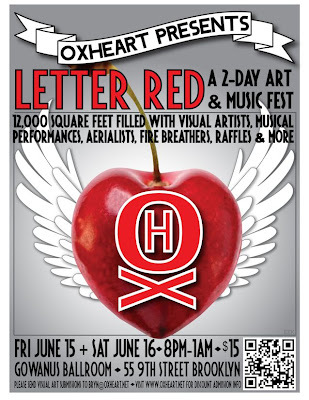 Fast forward to Friday, June 15 at 9am, the day of OXHEART’s first show, “Letter Red.” I hauled myself out of bed at 7am (I’m a freelancer, cut me a break), threw on my art-hanging clothes, and made the trek to Brooklyn. Arriving, I saw all of the metal working equipment still had to be put away. The floor had to be swept, seating to be arranged, the bar to be set up, all of the art to be hung. I tried forcing myself to relax but had trouble unfurrowing my brow. After a while, though, the kind gentlemen at the Gowanus Ballroom had cleaned everything and hidden it away. I had a quick lesson in hanging artwork and how to hammer nails properly so I did not stand idly by. I ran around greeting artists and assembling wall spaces, as did Bryn and the volunteers helping that day. By noon I was still terrified, but more art was getting hung. By 4 o’clock, my body ached and, though there was more art on the walls, I was becoming unpleasant and I took an ibuprofen and chased it with beer. I was speaking in loud, angry tones. If I didn’t leave, I would have become even more vile, so it was time to go. I got home, took four Advil, got in the shower, got dressed and ate a sandwich. It was 6:30. Time to go back to Brooklyn. Uncrumpled and no longer a ticking time bomb, I sat calmly at the front desk at the venue and people began to trickle in. They looked appreciatively around at the artwork we had all hung. I heard cries of “Wow, this is incredible!” and “Whoa, cool!” In those instances, I knew everything was worth it. Throughout the evening I was able to circulate upstairs and watch people listening to the bands with rapt attention, holding up their iPhones to take pictures of the aerialists and firebreathers, climbing in the on-site treehouse. We had done it. Riding the high of an evening well done, we hung out at the venue long after the party ended, dancing and jamming and drinking. I took my shoes off and my feet were covered in dirt and it was brilliant. Bright, sunny energy and love echoed through all of us (The second night was just as successful). This is what it was all about. At the risk of sounding like an '80s coming-of-age-flick, my life is truly changed. I don't know what will happen next with OXHEART, I don't know what the future holds, but I know I just want to keep helping throw these parties as long as possible. Let's just do it, and think about how impossible it seems when we're done. If you’re interested in learning more about OXHEART, visit us online at oxheart.net, check us out on Facebook at facebook.com/oxheartnyc, or follow us on Twitter at @oxheartnyc. Our OXHEARTs hug you. OXHXO.